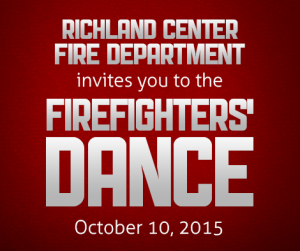 On behalf of the Officers and Firefighters of the Richland Center Fire Department, I cordially extend to you an invitation to our Annual Firefighters’ Dance to be held at the Phoenix Center located in Richland Center on Saturday, October 8, 2016. “Monty Berger and the Country Gold Band” will perform from 6:00 – 11:00 p.m. As in the past, prizes will be awarded through a drawing using the enclosed ticket stubs in an effort to highlight fire prevention and safety. The theme for the 2016 Fire Prevention Week (October 9th-15th) is… “Don’t Wait – Check the Date! Replace Smoke Alarms Every 10 Years” One of the best ways to protect your family is to have properly installed, and regularly checked smoke detectors on all levels and in all sleeping areas of your home. Every home/apartment should have an evacuation plan in the event of a fire and should practice using the plan. The Richland Center Fire Department is comprised of 45 firefighters providing 24 hour-a-day fire suppression, fire prevention, and rescue services to 310 square miles of Richland County. Established in 1870, the department has continued to do this for the past 146 years. We have always been able to rely on your financial support to help provide the department with needed equipment. Funds received last year were used to purchase technical rope rescue equipment, add a SCBA fill station to Rescue 706, and upgrade the department’s extrication equipment. We will continue to upgrade and add to both the extrication equipment used at accident/rescue scenes and the technical rescue/confined space rescue equipment. 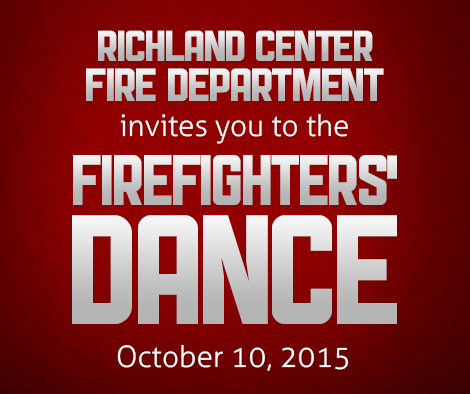 As always, the RCFD members appreciate your continued financal support. We look forward to seeing you on Saturday, October 8th, which is our opportunity to extend our thanks for your financial assistance. The return of the enclosed ticket stubs and tax-deductible contribution will show your support and enter you in our drawing for door prizes on Saturday evening. You need not be present to win. Please join us for an enjoyable evening of music and dance.